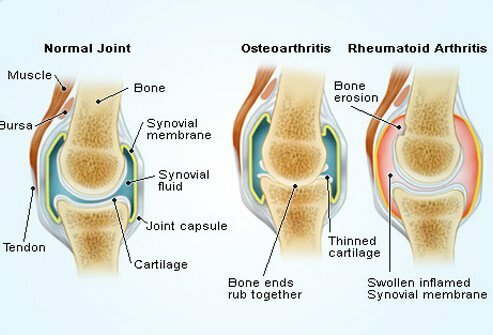 Rheumatoid arthritis (RA) is an autoimmune disease where the body attacks the lining tissue of joints, causing chronic joint inflammation. While it primarily affects joints, it can also cause inflammation of organs, such as the lungs, eyes, skin, and heart. People with RA may experience an increase in symptoms –called flares – that can last for days or weeks. They may also have periods of remission where they have few or no symptoms. There is no cure for rheumatoid arthritis, but medications can stop the progression of the disease and ease symptoms. According to the Arthritis Foundation, rheumatoid arthritis affects about 1.5 million people in the U.S. Women develop RA two to three times more often than men, and symptoms in women tend to appear between the ages of 30 and 60, while symptoms often develop later in life for men. There may also be a genetic basis for the disease. Cigarette smoking and periodontitis, are also risk factors. Juvenile rheumatoid arthritis (JRA), also called juvenile idiopathic arthritis (JIA), is a type of arthritis that occurs in children ages 1 to 16. To ultimately be diagnosed with JRA the child's symptoms must last at least six weeks. Several methods of treatment are available for juvenile rheumatoid arthritis. Most children need both medicinal and nonmedicinal treatments to relieve pain, reduce swelling, maintain full movement in their joints, and treat complications. Medication -- Over-the-counter pain medicines like aspirin, ibuprofen, and naproxen are often the first line of defense against the pain of juvenile rheumatoid arthritis. If those pain relievers do not work, a class of drugs that slows the progression of juvenile RA may be used called disease modifying antirheumatic drugs (DMARDs). The most commonly prescribed DMARD for juvenile RA is methotrexate. Other drugs may be used for serious disease, including corticosteroids and biologic agents. These medications have side effects that should be discussed with your doctor. Physical Therapy -- Regular exercise designed by a physical therapist can help to retain a child’s range of motion in their joints, as well as muscle tone. 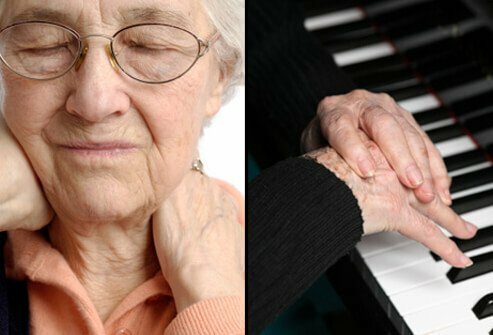 Arthritis refers to more than 100 conditions that affect the musculoskeletal system. The joints are the parts of the body where bones meet each other. 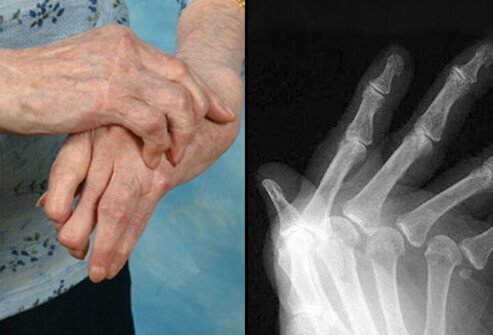 When arthritis is present, the joints may become inflamed, stiff, red, and painful. Damage from RA may occur in tissues surrounding the joints including the tendons, ligaments, and muscles. RA is one type of arthritis classified as 'systemic,' meaning it can areas throughout the body. In some patients, symptoms may extend to the skin and eyes, and internal organs, including the liver, kidneys, heart, and lungs. The exact cause of RA remains unknown, but several risk factors have been identified. 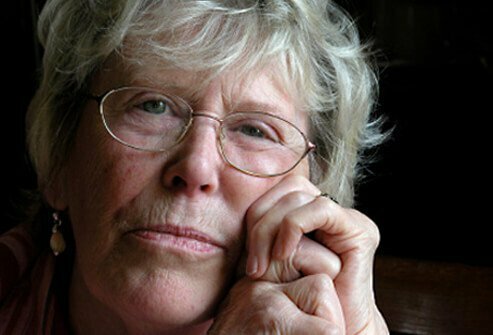 Women are diagnosed with RA more often, and it is suspected estrogen may play a role. Several studies have shown there is a genetic component to developing RA. Cigarette smoking appears to increase the risk of developing the disease. Occupational exposure to certain dusts such as silica, wood, or asbestos can also lead to a higher risk for developing the illness. 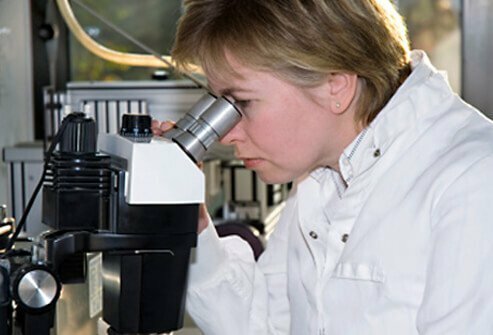 It is thought there may be a viral or bacterial infectious cause of RA but that is still being studied. When a person with RA has symptoms including joint inflammation and pain, this is called a flare. Flares may last from weeks to months. This can alternate with periods of remission, when symptoms are minimal to nonexistent. Periods of remission can last weeks, months, or even years. After a period of remission, if the symptoms return this is called a relapse. It is common for RA patients to have periods of flares, remissions, and relapses, and the course of the illness varies with each patient. In addition to the hallmark symptoms of swollen, painful, and stiff joints and muscles, patients with RA may also experience other symptoms. In addition to these symptoms, muscle and joint stiffness of rheumatoid arthritis is usually worst in the morning or after extended periods of inactivity. With RA, hands are almost always affected. However, RA can affect any joint in the body, including wrists, elbows, knees, feet, hips, and even the jaw. Usually, joints are affected symmetrically, meaning the same joints on both sides of the body are affected. 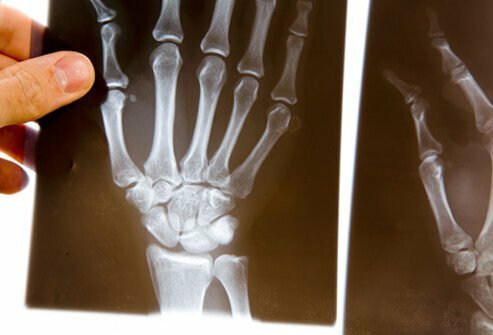 Rheumatoid arthritis can be very painful, and chronic inflammation can lead to debilitating loss of cartilage, bone weakness, and joint deformity. 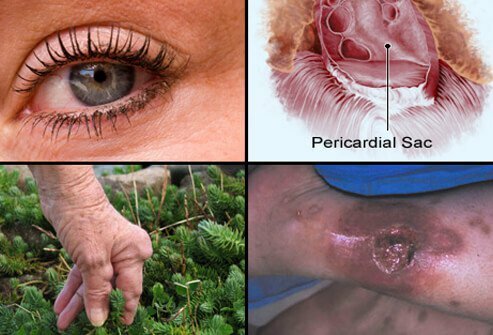 Eyes and mouth: inflammation of the glands in the eyes and mouth causes dryness, and an autoimmune disease of the tear and saliva glands called Sjögren's syndrome. It can also lead to inflammation of the white part of the eye (scleritis). Lungs: inflammation of the lung lining (pleuritis) or the lungs themselves can cause shortness of breath and chest pain. Heart: inflammation of the tissue surrounding the heart (pericarditis) can cause chest pain, which tends to be worse when lying down. RA patients are also at greater risk for heart attacks. Spleen: inflammation of the spleen (Felty's syndrome) can cause a decrease in white blood cells, which raises the risk of infections. 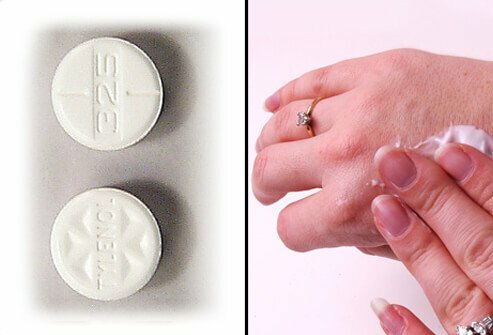 Skin: firm lumps under the skin (rheumatoid nodules), typically located around affected joints, often on pressure points such as elbows, fingers, and knuckles. Blood vessels: inflammation of the blood vessels (vasculitis) can limit blood supply to surrounding tissues, causing tissue death (necrosis). 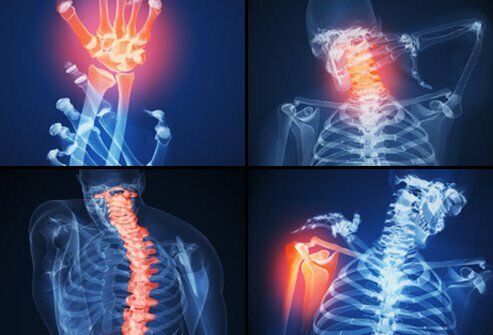 A rheumatologist is usually an internal medicine specialist or pediatrician, with specialized rheumatology training to identify and treat the more than 100 different types of arthritis in addition to other autoimmune disorders such as lupus, polymyositis, and vasculitis. There is no singular test to diagnose rheumatoid arthritis. First, the doctor will perform a physical and take a history of symptoms. The joints will be examined to determine if there is inflammation and tenderness. The heart, lungs, eyes, mouth, and extremities will be evaluated. And the skin may be examined to look for rheumatoid nodules. The doctor may order blood tests or X-rays to help diagnose the condition. 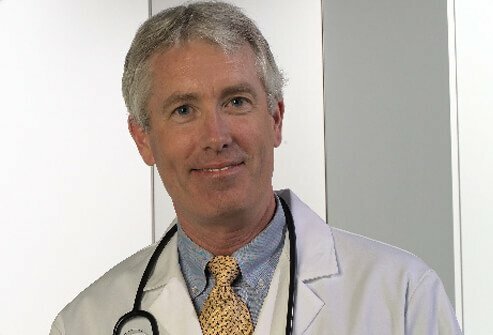 Many other diseases such as gout, fibromyalgia, and lupus may resemble rheumatoid arthritis, so the doctor will rule out these conditions before making a diagnosis of RA. 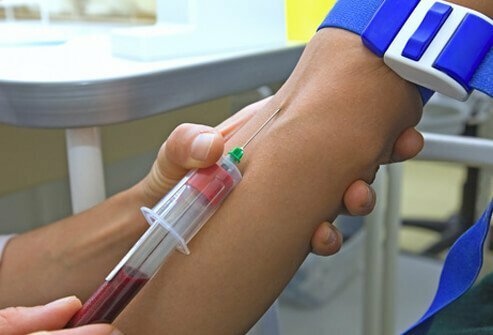 Blood tests are usually run to help make a diagnosis of rheumatoid arthritis. 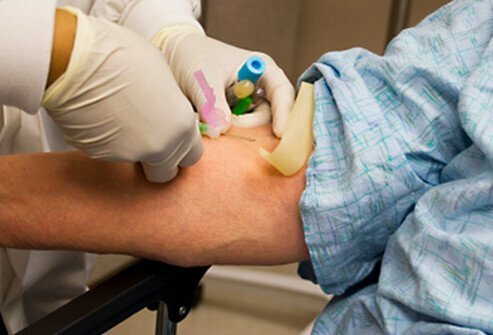 These tests check for certain antibodies including anti-cyclic citrullinated peptide antibodies (ACPA), rheumatoid factor (RF), and antinuclear antibodies (ANA), which are present in a majority of RA patients. Rheumatoid factor (RF) is present in about 75% to 80% of RA patients, and a high RF may indicate a more aggressive form of the disease. Antinuclear antibodies (ANA) is not specific for a diagnosis for RA, but their presence can indicate to the doctor that an autoimmune disorder may be present. Other blood tests that may be run can help the doctor determine the extent of the inflammation in the joints and elsewhere in the body. The erythrocyte sedimentation rate (ESR, or "sed rate") measures how quickly red blood cells fall to the bottom of a test tube. Typically, the higher the sed rate, the more inflammation there is in the body. Another blood test that measures inflammation is the C-reactive protein (CRP) test. If the CRP is high, inflammation levels are usually high as well, such as during a flare of rheumatoid arthritis. Another test used to diagnose rheumatoid arthritis is X-ray. Early in the disease X-rays can be helpful as a baseline test and they can be useful in later stages to monitor how the disease progresses over time. Other imaging tests used include ultrasound and magnetic resonance imaging (MRI). 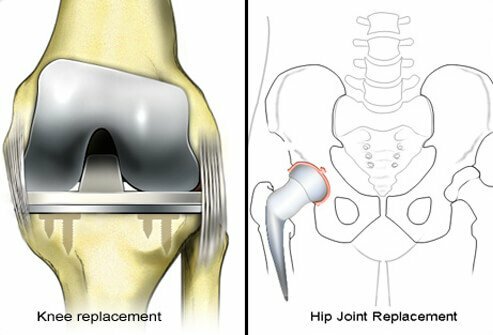 A joint aspiration procedure (arthrocentesis) may be performed to obtain joint fluid to test in the laboratory. 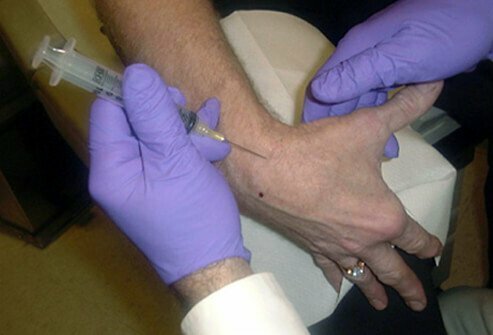 A sterile needle and syringe are used to drain fluid from the joint, which is then analyzed to detect causes of joint swelling. Removing this joint fluid can also help relieve joint pain. Sometimes, cortisone may be injected into the joint during the aspiration procedure for more immediate relief of inflammation and pain. 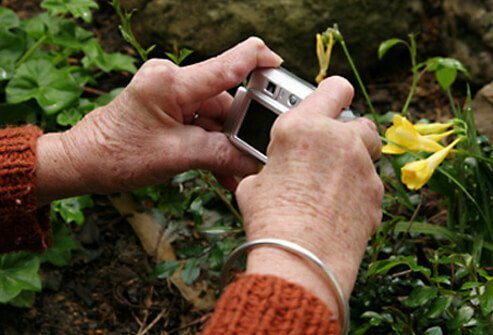 Currently, there is no cure for rheumatoid arthritis, but there are a number of medications that can ease its symptoms. Most treatments are aimed at remission, where the patient has few or no symptoms of RA. When treatment is started early on in the disease process, this can help minimize or slow damage to the joints and improve quality of life for patients. Treatment usually involves a combination of medication, exercise, rest, and protecting the joints. Sometimes, surgery may be needed. If you are diagnosed with rheumatoid arthritis, the sooner the treatment begins, the better your outcome is likely to be. There are many different medications used to help alleviate symptoms of RA and with the goal of bringing a patient into remission. Drugs used to reduce pain (analgesics) and inflammation (NSAIDs) are often considered "first-line" drugs as they are fast-acting and can relieve symptoms quickly. Medications such as DMARDs and biologic drugs take longer to have an effect, but they can help prevent inflammation and joint damage. While there is no special diet people with rheumatoid arthritis should follow, eating a healthy, balanced diet is always recommended, and some foods may help ease inflammation. Omega-3 fatty acids found in fish oil may offer anti-inflammatory benefits, so fish such as herring, mackerel, trout, salmon, and tuna may be a part of a healthy diet. If you choose to take fish oil supplements, check with your doctor for the proper dosage. Extra fiber from fruits, vegetables, and whole grains can result in a lower C-reactive protein (CRP) in the blood. High levels of CRP indicate inflammation. Vitamin D may help lower the risk for RA in women. Eggs, fortified breads and cereals, and low-fat milk contain Vitamin D.
Rheumatoid arthritis can also affect other areas of the body, and these symptoms may be treated individually. 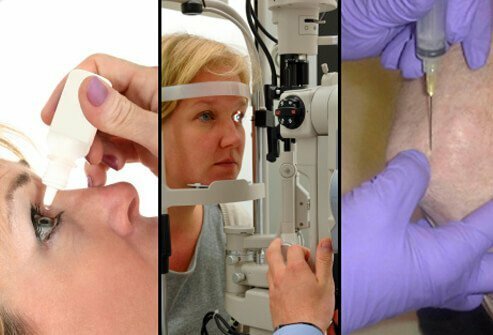 Sjögren's syndrome can cause eye dryness and may be treated with eye drops to moisturize, and also drops to increase tear production such as cyclosporine (Restasis). Dry mouth related to Sjögren's may be treated with certain mouthwashes and toothpastes. Inflammation of the lung lining (pleuritis) or the lungs themselves may require treatment with corticosteroids. 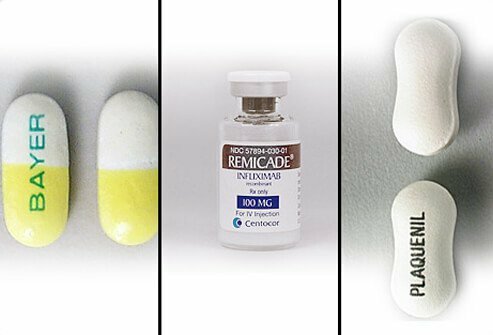 Inflammation of the tissue surrounding the heart (pericarditis) usually requires keeping the overall inflammation levels down and many RA drugs can help. Inflammation of the spleen (Felty's syndrome) can cause a decrease in white blood cells, which raises the risk of infections and may be treated with a stimulating factor (granulocyte stimulating factor/GSF) used to increase the amount of white blood cells. Rheumatoid nodules may require injections of steroids, or surgery to remove them if they are severe. Inflammation of the blood vessels (vasculitis) may be treated with painkillers, antibiotics, and protecting the areas affected. A balance of physical activity and rest periods are important in managing rheumatoid arthritis. Exercise more when your symptoms are minimal, rest more when your symptoms are worse. Exercise helps maintain joint flexibility and motion. 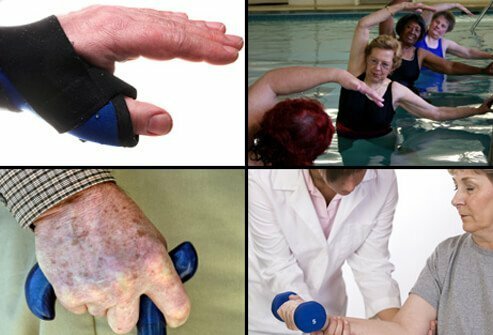 There are therapeutic exercises with physical therapy that is prescribed, that can help with strength, flexibility, and range of motion of specific joints or body parts affected by your RA. Many recreational activities such as walking swimming are helpful because allow movement with little to no impact on the joints. Consult your rheumatologist or physical therapist to find out what exercises are right for you. Physicians often recommend the following sports and exercises for their relatively low-stress impact on joints. Just as physical activity is important, so is rest. When you have an RA flare and your symptoms are worse, it is best to reduce your activity to help minimize joint inflammation and pain, and to cope with fatigue. With severe rheumatoid arthritis, surgery may be needed to reduce pain and improve joint function. Some surgeries include joint replacement, fusion of joints (arthrodesis), tendon reconstruction, and removal of inflamed tissues (synovectomy). 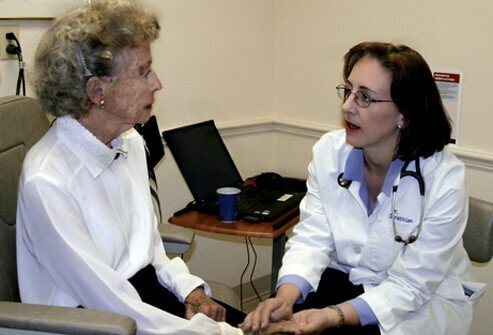 Discuss your treatment options with your doctor to find out what is right for you. American College of Rheumatology: "Exercise and Arthritis. ", "Rheumatoid Arthritis", "What is a Rheumatologist"
Arthritis.org: "Medications for Rheumatoid Arthritis", "More Than Just Joints: How Rheumatoid Arthritis Affects the Rest of Your Body", "Nutrition Guidelines for People With Rheumatoid Arthritis"
National Institute of Arthritis and Musculoskeletal and Skin Diseases: "Questions and Answers about Juvenile Arthritis"
RheumatoidArthritis.org: "Exercise for Rheumatoid Arthritis"
UpToDate: "Clinical Features of Rheumatoid Arthritis", "Diagnosis and Differential Diagnosis of Rheumatoid Arthritis", "Epidemiology of, Risk Factors for, and Possible Causes of Rheumatoid Arthritis", "Patient Information: Juvenile Rheumatoid Arthritis (The Basics)"